Ranger is now a member of the preschool set. That's a pretty big milestone, but one that we are almost as proud of is being a budding member of the board gamer set. You see, Ranger sees us playing games pretty regularly and has recently taken a keen interest in joining in the fun. Luckily, Adrienne has been preparing for this very situation and has been stockpiling age appropriate games that she comes across in thrift stores for months (and we'll surely talk about some of them). With an eye towards his fascination, we also recently accepted some games from Gamewright to test with him. One of those games was Hula Hippos. Hula Hippos is a dexterity game that requires players to spin a wooden ring and then flick wooden hippo tokens in such a way that they wind up in the playing area inside the ring once it stops spinning. It is the American version of the German Habba game Maus nach Haus, which had the same mechanic but replaced the hippos with little wooden mouse tokens. There's no real complexity to the game(s) beyond that. Line the tokens up around the edge of the playing area, each player takes a turn spinning the ring (something that my three and a half year old son can handle with the well balanced wooden ring) and then each player tries to flick the token into the playing area. Play continues until one player has successfully captured four hippos when the ring has stopped spinning. This may take a few turns around the table as some rounds go scoreless and others score one to a couple of points per spin. I'll be straight with you. I really like this game. It is simple enough that Ranger can start learning the basics of playing any game; learning to wait his turn, what a turn consists of, following the rules, setting up the game, etc. 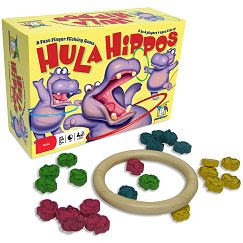 Part of the nice thing about Hula Hippos is that each turn is so short, lasting only as long as the ring spins, that we can take time to focus on all these parts of general game play. Before we start a turn, we line up our hippo tokens and give Ranger all the time he needs to mimic us as he does the same (and that can take a little while with a preschooler). Then we try to take a practice flick of the tokens around the table. This gives Ranger a chance to see how to do it so that he can imitate us in learning this skill. Then whomever's turn it is to spin the ring, takes the turn and we do our best to judge our shots so that the ring stops around our tokens. If we're lucky, we have the opportunity to practice counting for the scoring round. Even though this is a simple game, it isn't easy. It takes a bit of skill and luck to position the hippos such that they actually score points. Once (and only once), I was able flick a hippo hard enough that it knocked the ring from its rotation straight down around its hippo captive. Kids will definitely gain some dexterity skill over time while playing this game. There is a visceral thrill you get when actually capturing one of your herd and Ranger gets very excited when any player scores a point. Hula Hippos is fun enough that as soon as one game is over, we're generally setting up for a few more rounds. So, if you want a simple game that is rewarding to play and takes a bit of skill to master, definitely give Hula Hippos a try. If you have younger players (recommended ages are for 5 and up), pick this up and try it out. As it has small pieces that could present a choking hazard, be careful playing it with these younger players, but a well supervised game shouldn't pose a problem. What dexterity games do you like to play? Love Gamewright. Do they make any bad games? Seriously? This looks like one we may have to get. Thanks for the review. Oh, I want to play a game of Hula Hippos with Ranger! We need to play together soon! On the game-front here, we played one short game of Save Dr. Lucky with the big kids last night, and one long game of Scrabble. Hooray! Andy got home and found us just getting started. Even though he was pooped, he was a good sport about playing for about 2 hrs before we put the kids to bed very late in honor of the beginning of Spring Break. Hugs to you guys today!